"The best choice for large outdoor areas because of the 180-degree lighting." "The handy spotlight emits 140 lumens when motion triggers the sensor." "Its glass and metal construction has a beautiful finish." "You can expect the eco-friendly bulb to last up to 25,000 hours." "Instantly turns on at night when motion is detected up to 15 feet away." "You can place the lamp in your yard without worrying about the power." "Mount the light on any flat ceiling surface outdoors." 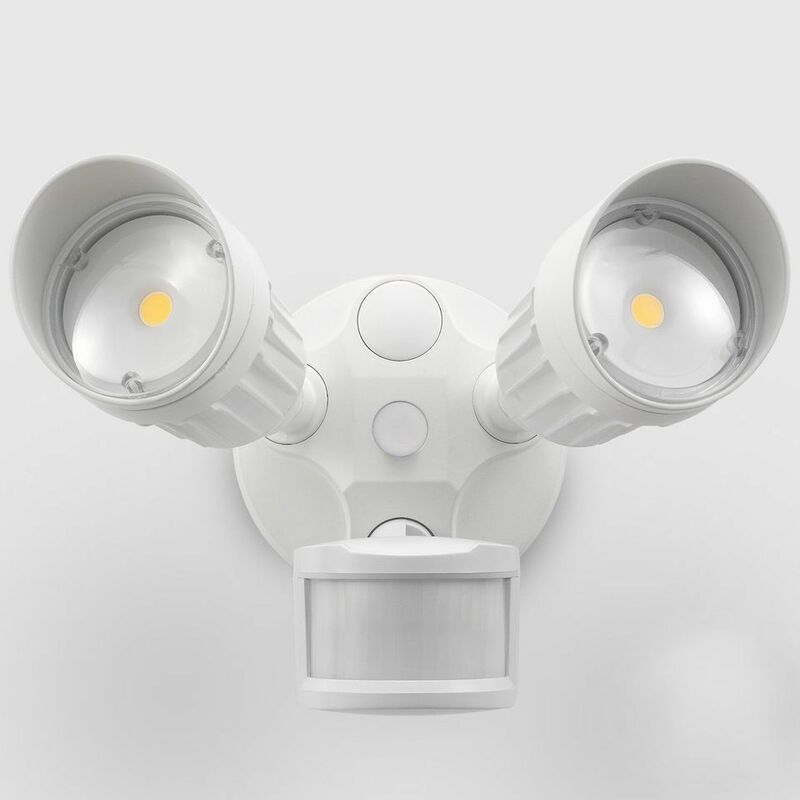 Dual-headed activated sensor lights are considered the best choice for large outdoor areas because they have an 180-degree lighting and sensing angle. This model and make is a crowd favorite for three reasons. First, it emits up to 1600 lumens of bright, crisp light — that's roughly the equivalent of a 120 watt light bulb. Second, the maximum motion detecting range is adjustable up to 70 feet. Third, the illumination timing can be predetermined based on your needs. If you’re looking for something that’s both weather and corrosion resistant this light’s rugged housing was built to last. Even better, the light comes with a five year or 50,000-hour warranty. The light is also DLC QUALIFIED, making it eligible for an energy saving rebate in participating states. What’s the single catch? The light requires a hard-wired installation. For around $130 you can hire a professional installer at the time of purchase. If you’re seeking the best overall value for your dollars, this LED option by Mr. Beams wins hands down. First off, since it's battery powered, it's a snap to install, virtually anywhere, including tricky spots like fences and trees. You'll need a screwdriver to get the job done using the included hardware. The handy spotlight emits 140 lumens when motion from up to 30 feet away triggers the sensor. No worries about inclement weather affecting function because a tight, weatherproof seal keeps the fixture protected. But, a few of the lights pros are also cons. While a set of fresh batteries should provide one year of light with up to 10 activations per day, heavy use will drain them quicker. Also, while the spotlight illuminates up to 400 square feet, don't expect it to be as bright as a hard-wired option that usually requires professional installation. However, since the latter can cost hundreds of dollars, this light is a particularly smart choice that costs less than $20. Add a dash of curb appeal to your entrance with this Energy Star certified Mission-style motion light. Its glass and metal construction has a water resistant finish that will keep the lantern functional and beautiful for years to come. Even better, its 150-degree motion sensor uses pulse-count technology that prevents false triggering by windy weather because it reads both movement and heat up to 30 feet. Not a fan of oil rubbed bronze? The light is also available with a silver finish. The install and forget it light fixture saves energy by using a photocell that keeps it off during the day and motion activated at night with your choice of three auto modes for 1, 5 or 10 minutes of light. There’s also an override mode for dusk-to-dawn illumination via a wall switch. Unlike LED lighting and solar powered lighting this electric unit requires a hard-wired installation and a 60-watt incandescence bulb to operate. While connecting to a wall switch isn’t necessary for primary function, as we just mentioned in the previous paragraph, it’s a must if you want to keep the light on all night. This motion detecting LED by Sengled Smartsense is a weatherproof bulb suitable for wet locations. It was designed to turn any outdoor fixture with an E27 based into a security floodlight. To install, just screw the bulb into a socket—no apps, wires, or additional equipment is necessary. Afterward, it will light up for 90 seconds whenever it's 100-degree infrared sensor detects motion within a 30-foot range. Concerned about associated costs? This floodlight will help you rest easy with its super low energy consumption that's around 0.2 watts. Also, you can expect the eco-friendly bulb to last up to 25,000 hours. Read more reviews of the best outdoor lightbulbs available to purchase online. You don’t need tools or hardware to install these weather resistant, and battery powered stake lights. They were designed specifically to illuminate walkways and staircases with a housing design that reflects 35 lumens of neutral light downward. To install, simply add a set of C batteries and stick the pointy end into the ground. If you prefer to mount the fixture on a vertical surface, just remove the light from the stake before hanging. The lights sold in packs of two instantly turn on at night when motion is detected up to 15 feet away. There’s also an optional GlowMode setting that emits a constant soft light until motion triggers full brightness. While the LED bulb never needs replacing you can't say the same for the batteries. Expect to refresh them after 50 hours illumination. It can be difficult to get adequate coverage with security lights in an outdoor space. 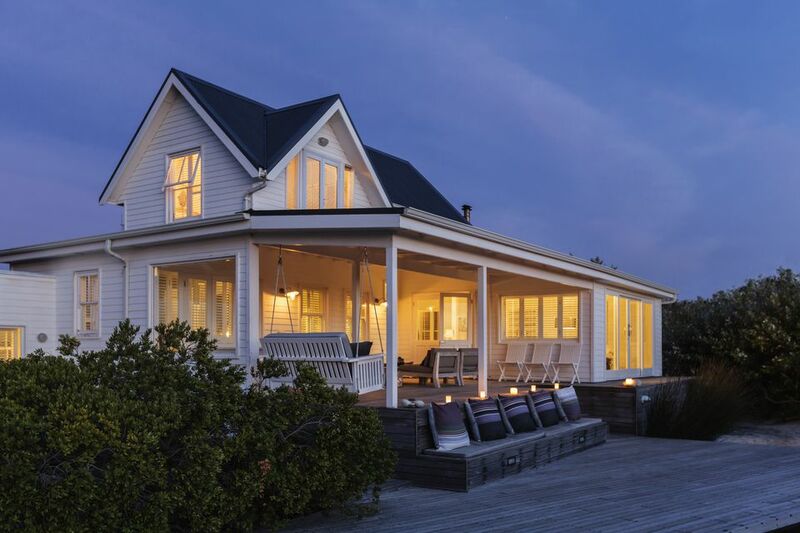 Normal security lights require a hardwired connection to the home’s electrical network in order to work on a consistent basis. If you have a large yard or small home, this can be a challenge. For larger yards, the better option is the solar-powered Outdoor Garden Solar Motion Lamp which works without the need for a direct connection. Coming in a pack of two individual lights, each one with a solar panel, you can place each lamp in an optimal spot around the yard without worrying about the power. Each lamp uses 60 individual LED lights to project a consistent area of light. The solar panels will recharge the batteries of the lamp throughout the day in a variety of outdoor conditions. In addition to the solar recharging, each lamp is also customizable so you can set up a timer or adjust the sensor range to a maximum of 16.4ft ahead. The timer itself ranges from eight seconds to two minutes to control how long the light remains on once the sensor is triggered. Traditional motion lights are a bit of an eyesore when it comes to the curb appeal of your home. While it is nice to have a motion light for security and safety, you shouldn’t have to sacrifice the look of outdoor spaces such as a patio or entryway. The Heath-Zenith Octagonal Light, on the other hand, will blend right into the existing exterior décor while providing the same motion-activated coverage as traditional security lights. This light utilizes four separate incandescent bulbs to provide 360-degree coverage in all directions. You can mount the light on any flat ceiling surface outdoors using the included hardware set. In addition to security lighting, the dual brightness settings also provide great illumination for enjoying the outdoor space late at night. The motion sensor can be triggered up to 30 feet away. Our reviewers spent 147 hours testing one of best outdoor motion sensor lights available. To get the most accurate results, our testers installed it at home and observed how it reacted to different motions, night after night. We asked our reviewers to consider the most important features when using this outdoor motion sensor light, from its range to its reactiveness. We've outlined the key points here so that you, too, know what to look for when shopping. Location The spot where you plan to put your motion sensor light often dictates which one is the best fit. If you’re putting it on the porch, you may want a wall- or ceiling-mounted unit, while a light on the garage often benefits from having dual-headed sensors. There are also stake-style lights that are perfect for walkways and other areas of your yard. Wiring Think about whether you’d prefer a hard-wired motion sensor light or a battery-powered unit. Hard-wired products are generally more complicated to install, but you won’t ever need to change the battery. On the other hand, battery-powered units can be placed anywhere and are usually much easier to install. Design Depending on where your motion sensor light is located, you may want to consider how important its design is to you. Some units look like standard outdoor lights and will match your home’s aesthetic, while other products are more plain and utilitarian.